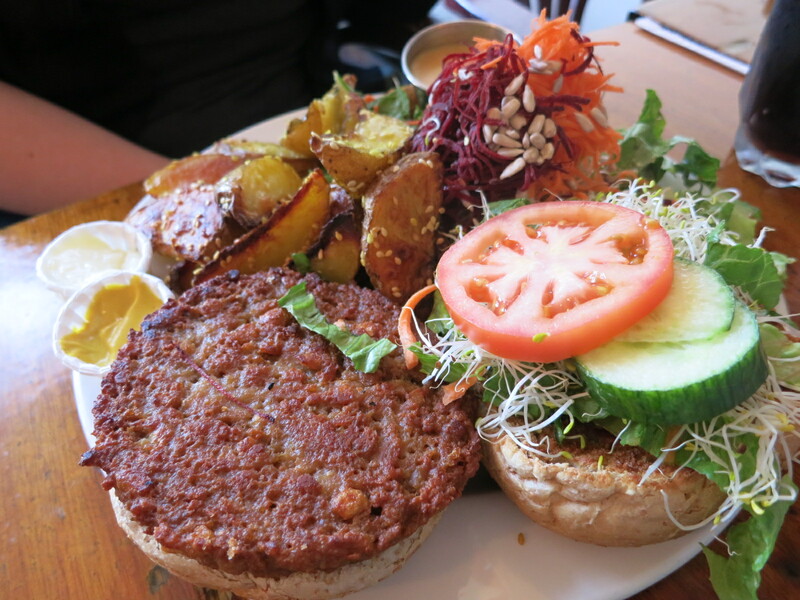 The Naam is a vegetarian restaurant in Kitsilano. Their entire menu is vegetarian and they have plenty of vegan options as well. The menu is pretty big and it consists of burgers, bowls, salads, desserts etc. It has a laid back hippy cafe kind of feel. I came here with my friend Katherine for dinner. I had heard people complain about the long waits here, but we were seated right away and our food didn’t take that long. Katherine had Sam’s burger platter ($14.25), which is a soy burger that comes with a side salad, sesame fries and miso gravy. I didn’t try the burger, but she said it was good. 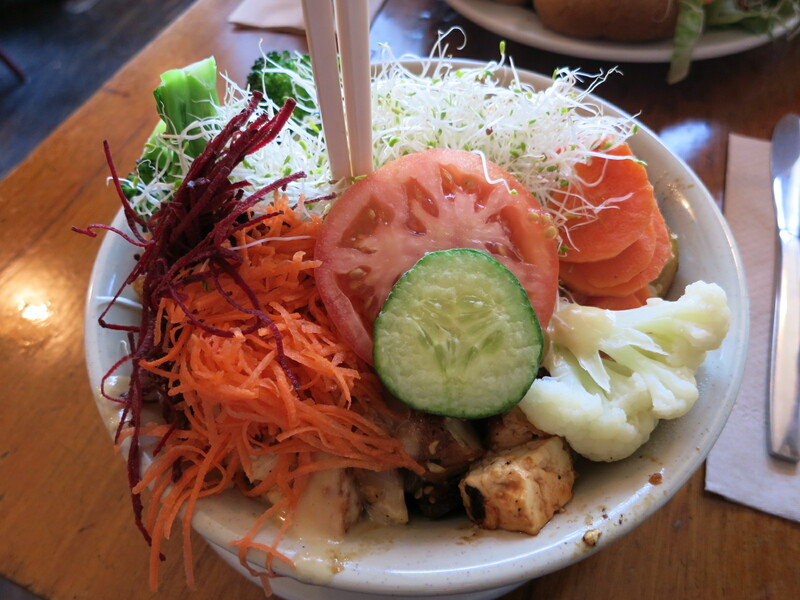 I had the Gold Dragon bowl ($11.25), which comes with Naam fries, cheese, miso gravy, steamed veggies, sprouts, carrots, and deep-fried tofu. This picture makes the bowl look really healthy and boring, but under that layer of vegetables is some good stuff. I loved the Naam fries, which are crispy wedge fries crusted with sesame. The miso gravy was also very flavourful and combined with the cheese, made the whole bowl gooey and delicious. They also have vegan cheese here and I asked if I could substitute that for the regular cheese. I’m trying to embrace eating tofu dishes more often and this was a good way to do it. The tofu was nice and firm and in perfect bite sized chunks that soaked up the flavours of the dish. I left the Naam feeling great about my experience and I enjoyed the food. However, when I got home a couple of hours later, I had horrible shooting pains in my stomach and I got pretty sick. I’m lactose intolerant and it turns out that they gave me regular cheese instead of the vegan cheese that I requested. Normally in restaurants I would take my lactase pills and there would be no problem, but I didn’t this time because I assumed that they had given me the vegan cheese. In a regular restaurant I wouldn’t be as shocked by this, but in a restaurant that specializes in vegetarian food and is vegan friendly that is a pretty big mistake. If this didn’t happen, I would have returned because the food tasted good and it was filling. Unfortunately, this situation scarred me, so I will not be returning.